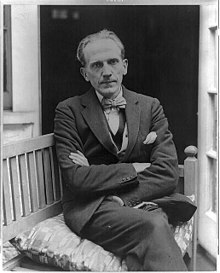 Alan Alexander Milne (/ˈmɪln/; 18 Januar 1882 – 31 Januar 1956) wis an Inglis author, best kent for his beuks aboot the teddy beir Winnie-the-Pooh an for various childer's poems. Milne wis a noted writer, primarily as a playwricht, afore the huge success o Pooh owershadowed aw his previous wirk. This page wis last eeditit on 22 Julie 2017, at 02:03.